As Investment Strategist and Discretionary Asset Manager at Private Capital Limited, Dr. Enzio von Pfeil offers impartial, commission-free advice on how to structure one's income. His personalised advice helps clients determine their own most appropriate asset allocation strategy to generate and protect wealth at all ages and stages of life. A one-off, transparent fee is charged for advice. He receives no commissions; thus, he is impartial & transparent. With more than 30 years' experience in global investment economics, Enzio understands currency, commodity, bond and equity movements as they relate to socio-political developments across the global economy. This experience and understanding of markets underscores the authority and integrity of his strategic asset allocation advice - which determines up to 90% of any portfolio's structural performance. Enzio provides a structured three-part programme to help clients organise their incomes to suit their own, personalized current needs and future lifestyles - particularly with a view to planning their pensions sensibly in terms of secure income and cost-effective investing. Spanning 3+ decades, Enzio is a high profile media commentator in Asia with interviews in TV networks like Bloomberg & Reuters. Enzio is the author of five books on global macro and investment economics. With his successful experience, Enzio helps clients to increase the probability of reaching their financial balance that they always have dreamed of - but have not had a mentor to guide them. Sterling will keep sagging because Brexit's path will be stony. In the nearer term, China's monetary policy bodes well for markets. In the longer term, her fiscal policy does not. In China, 10-year government bonds yield 2.7% - vs. 1.6% in the US, and negative yields in Japan for the same maturities. This means that China’s 10-year governments yield 69% more than their US counterparts. Don't worry about China's banks; do worry about America's student and car loans! Germany is desperate to keep Britain in the EU; PBOC tightens overnight rates massively to defend the RMB. The Fed is working with an anachronistic model. Keep buying China and America. My SFC type 4 and 9 Licenses are accredited to Private Capital Limited Ltd. I provide impartial, commission-free income planning advice to white-collar professionals. Provide zero-commission discretionary asset management to individuals and corporations. Bespoke macro investment advice focusing on strategic asset allocation. Politicians use trade balances measured using an approach created during Leonardo da Vinci's life. 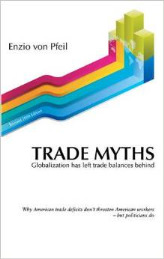 Enzio von Pfeil unmasks this dangerous anachronism and the myths that it spawns to justify protectionism. Using a state-of-the-art approach, he calculates America's huge global trade surplus - and warns against a new, dangerous form of protectionism directed at the overseas operations of American multinational corporations (MNCs), large and small. He wonders why these MNCs are financing the campaigns of some of the very politicians who are threatening their overseas operations. Private Capital Limited is a privately owned independent investment advisory firm, delivering bespoke financial advice and portfolio management services to international clients.